Your chances of developing hearing loss at some time in your life are unfortunately quite high, even more so as you get older. In the US, 48 million people report some amount of hearing loss, including just about two-thirds of adults age 70 and older. That’s the reason it’s crucial to understand hearing loss, so that you can identify the signs and symptoms and take protective measures to avoid injury to your hearing. In this article, we’re going to focus on the most common form of hearing loss: sensorineural hearing loss. Conductive hearing loss is less common and is triggered by some type of obstruction in the outer or middle ear. Common causes of conductive hearing loss include impacted earwax, ear infections, benign tumors, perforated eardrums, and genetic malformations of the ear. This article will focus on sensorineural hearing loss as it is by far the most common. This type of hearing loss is the most common and accounts for about 90 percent of all reported hearing loss. It results from damage to the hair cells (nerves of hearing) of the inner ear or to the nerves running from the inner ear to the brain. With sensorineural hearing loss, sound waves enter the external ear, strike the eardrum, and reach the inner ear (the cochlea and hair cells) as normal. However, as a result of damage to the hair cells (the tiny nerve cells of hearing), the sound signal that is directed to the brain for processing is diminished. This diminished signal is perceived as muffled or faint and normally affects speech more than other kinds of lower-pitched sounds. Additionally, unlike conductive hearing loss, sensorineural hearing loss tends to be permanent and cannot be corrected with medicine or surgery. The final two, direct exposure to loud noise and aging, represent the most common causes of sensorineural hearing loss, which is actually great news since it means that most cases of hearing loss can be prevented (you can’t avoid aging, obviously, but you can minimize the cumulative exposure to sound over the course of your lifetime). To understand the symptoms of sensorineural hearing loss, you should always remember that injury to the nerve cells of hearing usually develops very gradually. Consequently, the symptoms progress so gradually that it can be near impossible to detect. 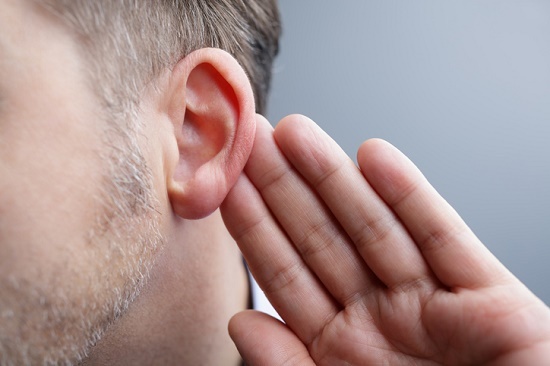 A small amount of hearing loss each year will not be very detectable to you, but after a number of years it will be very apparent to your friends and family. So although you might think everyone is mumbling, it could very well be that your hearing loss is catching up to you. If you detect any of these symptoms, or have had people tell you that you might have hearing loss, it’s best to arrange for a hearing test. Hearing tests are fast and pain-free, and the sooner you treat hearing loss the more hearing you’ll be able to retain. Sensorineural hearing loss is largely preventable, which is good news since it is without question the most common type of hearing loss. Millions of instances of hearing loss in the United States could be prevented by adopting some simple protective measures. Any sound above 80 decibels (the volume of city traffic inside your car) can potentially damage your hearing with long-term exposure. As the decibel level increases, the amount of time of safe exposure decreases. Which means at 100 decibels (the volume of a rock concert), any exposure over 15 minutes could damage your hearing. Implement the 60/60 rule – when listening to a portable music player with headphones, listen for no more than 60 minutes at no more than 60 percent of the max volume. Additionally, think about buying noise-canceling headphones, as these will require lower volumes. Protect your ears at live shows – concerts can vary from 100-120 decibels, far above the threshold of safe volume (you could harm your hearing within 15 minutes). Minimize the volume with the use of foam earplugs or with musician’s plugs that preserve the quality of the music. Protect your ears at your workplace – if you work in a high-volume occupation, talk with your employer about its hearing protection program. Safeguard your hearing at home – Several household and recreational activities generate high-decibel sounds, including power saws, motorcycles, and firework displays. Make sure that you always use ear protection during extended exposure. If you currently have hearing loss, all is not lost. Hearing aids, while not able to completely restore your hearing, can dramatically improve your life. Hearing aids can improve your conversations and relationships and can prevent any additional consequences of hearing loss. If you suspect you may have sensorineural hearing loss, book your quick and easy hearing test today!